An interim report released Wednesday by the Veterans Affairs Office of Inspector General concluded that patients experienced "significant delays" in treatment at a VA health care facility in Phoenix, Ariz., providing the administration's first official confirmation of problems that have been widely reported in recent weeks. "While our work is not complete, we have substantiated that significant delays in access to care negatively impacted the quality of care at this medical facility," the report explained. The IG's preliminary review found "multiple types of scheduling practices that were not in compliance" with the policies set by the agency. The report cited multiple lists separate from the official electronic waiting list for treatment, saying the additional lists "may be the basis for allegations of creating 'secret' waiting lists." One of the most damning charges to date has focused on the Phoenix facility's alleged creation of fake waiting lists to understate the amount of time veterans had been waiting for medical care. Some veterans passed away while they were awaiting treatment, but the report declined to specifically link those deaths to the creation of false waiting lists, saying more information is needed to establish that connection. "The assessments needed to draw any conclusions require analysis of VA and non-VA medical records, death certificates, and autopsy results," the report explained, promising a fuller accounting soon. The report also found that 1,700 veterans were waiting for a primary care appointment but were not found on any waiting list. "Until that happens, the reported wait time for these veterans has not started," the authors explained. "Most importantly, these veterans were and continue to be at risk of being forgotten or lost in [the Phoenix facility's] convoluted scheduling process." The report recommended that Veterans Affairs Secretary Eric Shinseki "take immediate action to review and provide appropriate health care to the 1,700 veterans" who were not found on any waiting list. It also recommended the initiation of a "nationwide review" of veterans on wait lists, to ensure that veterans are seen "in an appropriate time, given their clinical condition." Shinseki vowed in a statement released after the report to "aggressively and fully implement" the recommendations from the IG. He also said he had directed the Phoenix facility to "immediately triage each of the 1700 Veterans identified by the IG to bring them timely care." White House press secretary Jay Carney said in a statement that President Obama found the report's conclusions "extremely troubling." Carney also urged the VA to not wait for the full report before taking action to improve veterans' health care. The full IG report is expected in August, and it will provide a more comprehensive look at the problems plaguing the Phoenix VA facility as well as other facilities that have come under scrutiny. In the meantime, though, Congress is forging ahead with its own efforts to investigate the scandal, which has already generated growing calls for Shinseki's resignation. In a statement, Rep. Jeff Miller, R-Va., the chairman of the house Veterans Affairs Committee, said the report "confirmed beyond a shadow of a doubt what was becoming more obvious by the day: wait time schemes and data manipulation are systemic throughout VA and are putting veterans at risk in Phoenix and across the country." Miller called on Attorney General Eric Holder to launch a criminal investigation into "VA's widespread scheduling corruption." 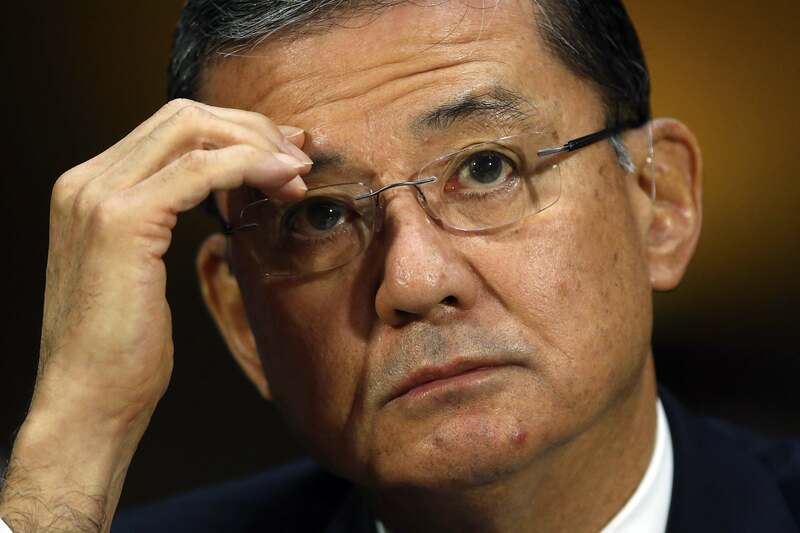 He also called for Shinseki to step down, saying the secretary is a "good man who has served his country honorably, but he failed to get VA's health care system in order." Miller had previously said he would wait for the IG report before recommending any personnel changes. In a news conference on Wednesday, Sen. John McCain, R-Ariz., similarly called for the Department of Justice to launch an investigation and for Shinseki to step down. "If Secretary Shinseki does not step down voluntarily, then I call on the president of the United States to relieve him of his duties -- to fire him," McCain said. Also on Wednesday, Sen. Mark Udall, D-Colo., became the first Democratic senator to call on Shinseki to step down, saying the report uncovered "systemic issues" that warrant the secretary's resignation. Udall is among a group of Democrats facing tough reelection fights in November who are being targeted by Republican National Committee robocalls that began Wednesday urging constituents to call their representatives and ask for an independent investigation into the entire VA.
Three VA officials are scheduled to testify before Miller's committee on Wednesday evening as part of a hearing that will examine whether a secret waiting list was created and then destroyed to hide how long veterans waited for care. Before the hearing, the House will vote on four VA reform bills, including one from former VA surgeon Rep. Dan Benishek, R-Mich., that aims to improve accountability within the agency and make it easier for supervisors to fire ineffective employees and withhold financial bonuses from those who do not make sufficient progress. The bill was introduced in May 2013, a year before the current scandal came to light. On the other side of the Capitol, Sen. Pat Toomey, R-Pa., announced Tuesday that he plans to introduce a bill that will allow veterans and other patients at VA hospitals to sue employees who falsified or destroyed health records, and authorize the firing of those officials. The senator argued his bill will shed light on the true extent of VA waiting lists.